Mine came with a different book which is the Whole Food Recipe book, which appears to have a lot more recipes than the books that come with the current version of the package. As I said in my post on Money, it’s the the one thing that honestly I probably should have bought from day one of food allergy life. If you’ve never used a high performance blender, compared to the $20-30 blender you had in college, or even the $100 Cuisinart that that I killed in a year, this thing is like driving a brand new loaded Porsche after driving a 15 year old Subaru that you had to add two quarts of oil a week, that you could put several fingers through the rust holes without touching the sides of the holes, and that the brakes that were so bad you had to downshift to slow down because the rotors were gone. I use the Vitamix wet container to make cashew milk and I don’t even have to soak or strain any more. I may soak for 20 minutes just to make sure they are clean, but the Vitamix obliterates the cashews so thoroughly that you don’t have to soak them. Same thing with rice milk. Cooked rice and water, and no more straining, the rice is just completely gone into the rice milk. I also use the wet container to make salad dressings. It emulsifies vinaigrette so well that it stays together in the fridge for days with the help of a little mustard (I use my home canned). I use the wet container to make hot sauces, it does an amazing job of pureeing peppers and other ingredients into a beautiful, consistent sauce. (See Chili Lime Hot Sauce, Cilantro Lime Green Cayenne Hot Sauce, Pink Grapefruit Sarit Gat Hot Sauce, and Curry Spiced Hot Sauce) I also use the wet container to make batters, such as for deep frying or when I make my “fake eggs” from garbanzo bean flour and black salt. If I use a bowl and a whisk, it takes me forever to get the lumps out. If I just throw everything in the Vitamix for a minute, it’s perfectly blended. I also use the wet container to make fruity drinks from my safe vodka or rum, my homemade jams, and ice. The wet container can almost make blackberry seeds in jam disappear when you put it in a fruity drink. You can also make soup in it, as the blender will heat the contents if processed long enough, although I’ve not tried this feature. I know that there are other high performance blenders out there, but I haven’t used them. If you don’t need to grind your own flour, you might want to choose something not quite so high test. But that being said, this blender is in my top three for kitchen tools I would bring to a desert island, presuming that the desert island had electricity. 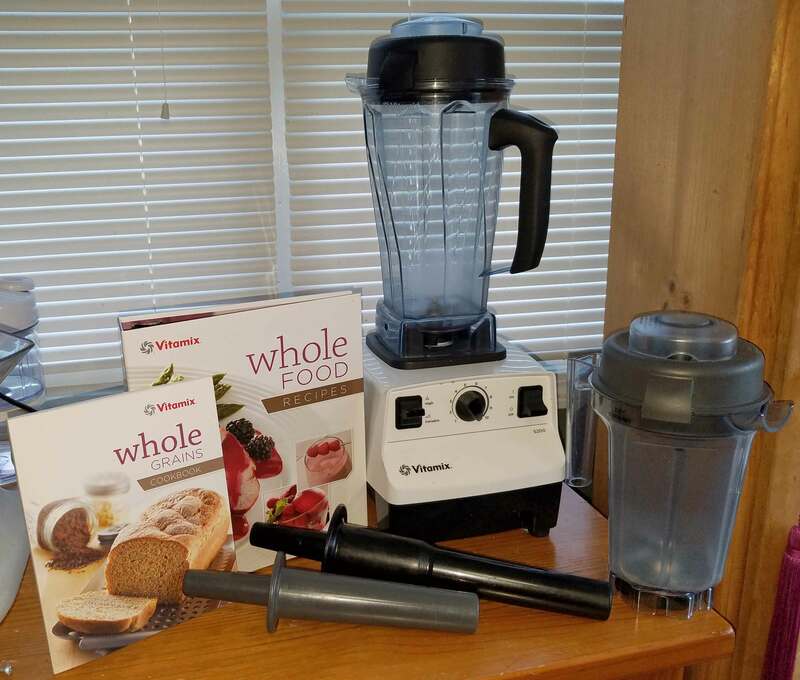 Let us know if you’ve got suggestions for blenders for our readers in the comments!